Figure 1: Schematic representation of the position of targets in a single well. Figure 2: NIH/3T3 cells were starved and stimulated with PDGF (100 ng/ml) for 5 or 40 minutes at 37ºC. For treatment with UV, exponentially growing NIH/3T3 cells were irradiated without serum starvation. Lysates were prepared and analyzed using the PathScan® Signaling Nodes I 4-Plex Array Kit. Luminescent signals were acquired using a Quansys Biosciences Imager. Spot intensity was quantified using Q-View™ software. The bar graph shows measurements of four different target proteins. Corresponding Western blots obtained with the same cell lysates are shown at the bottom. 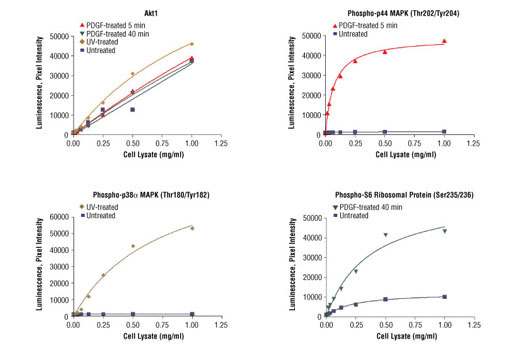 Figure 3: Cell extracts from unstimulated or stimulated NIH/3T3 cells were applied to wells at increasing total protein concentrations and analyzed. Luminescent signals were acquired and spot intensity quantified. The graphs show the relationship between the total protein concentration and the resulting strength of the luminescent signal for each target. Kit should be stored at 4°C with the exception of Lysis Buffer, which is stored at –20°C (packaged separately). CST’s PathScan® Signaling Nodes I 4-Plex Array Kit is based upon the sandwich ELISA principle. Rather than one immobilized antibody, these PathScan® 4-Plex Array Kits contain four different antibodies in each well of a 96-well plate. This allows the researcher to measure four different target proteins from a single well simultaneously. In addition, the incorporation of multiple phospho-specific antibody pairs allows the researcher to measure the activation state of important signaling nodes. The PathScan® Signaling Nodes I 4-Plex Array Kit allows the detection of: Phospho-p38α MAPK (Thr180/Tyr182); Phospho-S6 Ribosomal Protein (Ser235/236); Phospho-p44 MAPK (Thr202/Tyr204); and Total Akt1 protein. Briefly, 4 capture antibodies with distinct target specificity have been spotted onto the bottom of each well of a microwell plate. After incubation with cell lysates, the spotted antibodies capture the target proteins. Following extensive washing, a mixture of detection antibodies is added to detect the captured target proteins. 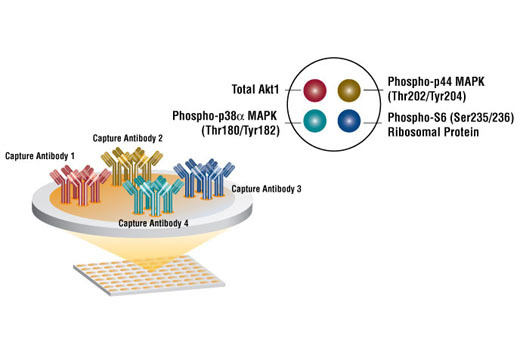 An HRP-linked secondary solution is then used to recognize the bound detection antibodies. Chemiluminescent HRP substrate is used to produce luminescent signal. PathScan® Signaling Nodes I 4-Plex Array Kit detects endogenous levels of all target proteins. As shown in Figure 2, stimulation of NIH/3T3 cells with PDGF promotes phosphorylation of S6 ribosomal protein at Ser235/236, p44 MAP kinase at Thr202/Tyr204 while p38α phosphorylation levels remain unaffected. Conversely, stimulation with UV induces phosphorylation of p38α at Thr180/Tyr182 and S6 ribosomal protein at Ser235/236, while not affecting phosphorylation of p44 MAP kinase at Thr202/Tyr204. Levels of total Akt1 remain unchanged with all treatments. Cells must respond in an appropriate fashion to many complex signaling events. Extracellular signaling cues are organized into well defined signal transduction modules that control fundamental cellular behavior. 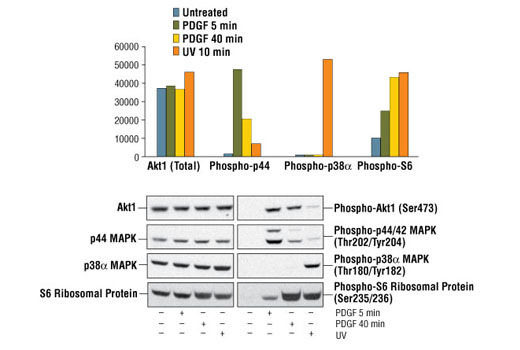 Two prominent signaling modules that are among the best characterized are the p44/42 MAP kinase (ERK MAPK) and p38 MAPK. The p44/42 MAPK is activated by a wide variety of extracellular signals including growth and neurotrophic factors, cytokines, hormones and neurotransmitters. p44/42 MAPK activation occurs through phosphorylation of threonine and tyrosine at the sequence T*EY* by a dual specificity kinase called MAP kinase kinase (MEK). p38 MAPK is dually phosphorylated in response to pro-inflammatory cytokines or cellular stress. These signaling modules are central controllers of fundamental cellular behavior such as growth, proliferation, movement, and response to stress. Growth factor stimulation results in phosphorylation of S6 ribosomal protein on Ser235/236, leading to an increase in protein synthesis and cell cycle progression. Phosphorylation levels of critical molecular switches such as MAPKs therefore serve as a reliable indicator of the activation state of the entire signaling module. The profiling of phosphorylation events using phospho-specific antibodies is now widely used to investigate diagnostic pathology (1,2). While profiling of protein phosphorylation events was shown to predict the progression of a tumor to a more invasive stage (3), it has been observed that the ratio between p44/42 MAPK and p38 MAPK may predict whether tumor cells will proliferate or enter a state of dormancy in vivo (4). PathScan® Signaling Nodes I 4-Plex Array Kit provides the researcher with means to profile numerous chemical compounds and obtain in-cell relative potency (5). Sheehan, K.M. et al. (2008) Oncogene 27, 323-31. Danna, E.A. and Nolan, G.P. (2006) Curr Opin Chem Biol 10, 20-7. Irish, J.M. et al. (2006) Nat Rev Cancer 6, 146-55. Aguirre-Ghiso, J.A. et al. (2003) Cancer Res 63, 1684-95.